Medieval and Renaissance European Arm Armor including Pauldrons, Full Arms, Elbow Cops and Cannons. Our Breast and Body Armour section has steel Breast Plates and Back Plates. 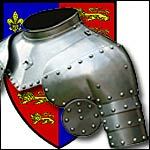 Our Medieval and Renaissance Gorgets, Bevors and Gorget and Pauldron Sets are fully functional neck and shoulder armor. Medieval Archer Knees, Lower Greaves, Sabatons, as well as Full Steel Leg armour, Knee Cops, Three Quarter Leg Armor. Each piece is fully functional. Fully Functional, Medieval and Renaissance Finger Gauntlets, Mitten Gauntlets, Half Gauntlets, Milanese Gauntlets. Plate Armor Gauntlets provide hand protection.